A former Egyptian member of parliament whose church is distributing aid to Iraqi refugees has spoken out about the gaps in humanitarian provision as the country heads into winter. He expressed concern about underfunded UN campsites and thousands living on the streets. Ehab el-Kharrat visited Erbil, a city in the Kurdistan region of Iraq that has attracted thousands of people fleeing conflict in the region. His church, Kasr el-Dobara church in Cairo, works among relief heavyweights such as the UNHCR, Caritas, and Samaritan’s Purse. It has sent a delegation to Iraq every ten days for the past two months, trying to stem the humanitarian tide. The congregation, which is made up of the middle and upper classes, has donated $180,000 to the relief effort with a further $120,000 from a fundraising trip to the United States. So far it has distributed 2,500 mattresses with pillows and blankets, and it supports a network of 2,200 families that receive a food basket every two weeks. This network is run in coordination with churches of Ankawa, a Christian neighborhood in Erbil. Ninety per cent of recipients are non-Christian – either Sunni Muslims also fleeing Islamic State, or else from the Yazidi minority. Revd Fawzi Khalil is director of relief ministries at Kasr el-Dobara church. He explained that the Chaldean Catholic Church of Ankawa has done an excellent job of caring for Christian refugees. Erbil’s population includes 160,000 Christians, and many have taken in fellow Christians. As a consequence Erbil’s church grouds are packed. The Mar Eliya refugee camp is located on the grounds of the church-run school. Nearby Mar Yousef camp is in the church itself and hosts mostly Muslims and Yazidis. Kharrat, a founding member of the Egyptian Social Democratic Party, described a pecking order of beneficiaries. 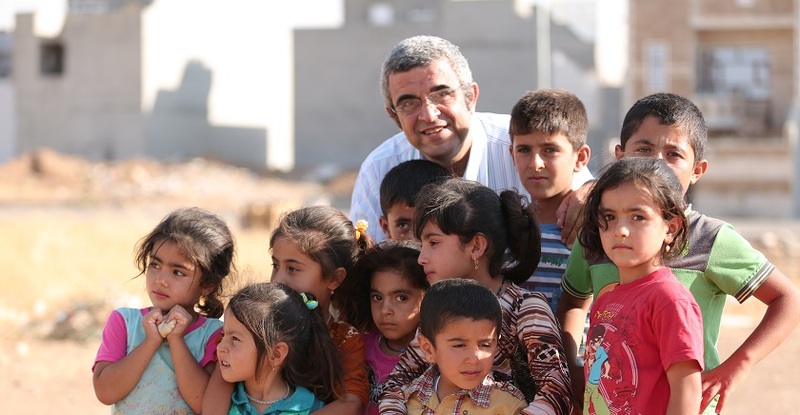 After refugees living in camps in church grounds, the next most fortunate group is those taken in by Kurdish families, he said, followed by those in unfinished buildings but under the sponsorship of church groups. Kasr el-Dobara’s efforts are toward this group, primarily. But thousands of Iraqis remain on the streets and in underfunded UN campsites in the desert. Kharrat noticed most tents were recycled from an earlier Syrian refugee camp, and are of deteriorating quality. Erbil has a permanent population of 1.5m people, and UN figures show there are 1.8m displaced Iraqis. But according to UN-Iraq, the three established UN camps can host only eight per cent of the refugees. Local families and churches take in the rest, but thousands sleep on the streets, under bridges, or in partially completed buildings, said Khalil. In speaking to Kurdish officials, he related their complaint that under the Maliki government, Baghdad ‘failed’ to send Erbil its constitutionally guaranteed share of the budget. The new government, formed on 8 September, has promised to do so ‘but not yet delivered’, he said. This has left the Kurdish regional government in a bind, as the UNHCR is a refugee agency, but those fleeing are technically considered internally displaced persons. With no agency possessing a clear mandate, the UN looks toward the government to lead. Even so, UN documents detail over 346,000 people who have been reached to some degree, with Saudi Arabia touted as a particularly generous donor. But this effort has not impressed the Kurds, says Kharrat. Khalil and Kharrat stated they were busy with their own work in the area but neither recalled seeing any Muslim groups among the refugees. Islamic Relief, however, has been working in the Anbar province to the west of Baghdad. It also distributed food parcels to 1,500 Christian families displaced in Nineveh. According to Eva Boutros, director of volunteer ministry for Kasr el-Dobara, the fact that Egyptian Christians have been present has made an impression on many. But whether Christians, Muslims, or the UN, no one is doing enough. By December if no solution is found, the already tragic situation will turn catastrophic. ‘Hundreds of thousands are unprepared for winter,’ Kharrat said, anticipating average lows of three degrees Celsius.